Regular, or standard, is a basic two-door pickup with a truck bed and no rear seat. By contrast, extended has two front-hinged doors and two back-hinged doors commonly called "suicide" doors because they can only open after the front doors open. Double cab (or "Quad cab" for Ram" resembles a truck bed attached to a four-door sedan. All door hinges are conventional, and there's a rear seat with some leg room. 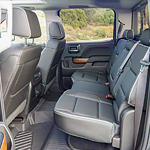 Crew cab builds on double, boasting four similarly sized, front-hinged doors and a full back seat. Mega, or CrewMax for Toyota, is the behemoth of pickup trucks, with four front-hinged door, rear seats and space behind the rear seats. Since this style emphasizes driver and passenger comfort, the attached bed is slightly shorter than other styles depending on the make.